Hanging with rock legends like Warren DeMartini is always a good time. If you missed our live Q&A session with Warren, watch the majority of the sit-down here, as he discusses his career with RATT, song-writing, his Charvel guitars, and a lot more in this exclusive interview session with Andy Aledort of Guitar World! Click here to browse through our Warren DeMartini guitars and gear! 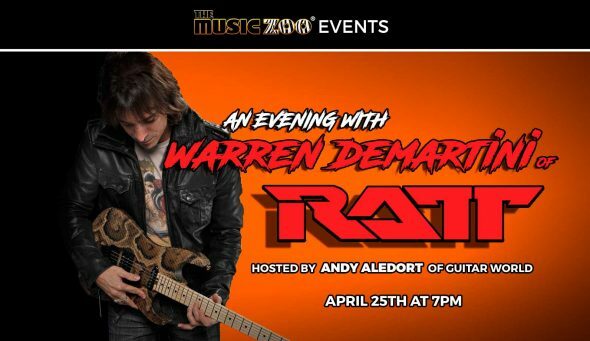 In-Store Event: Q&A With Warren DeMartini of RATT At The Music Zoo! Paul Riario from Guitar World provides us with an informative demonstration of the Danelectro ’64 guitar! Danelectro has offered an impressive variety of guitars since Evets Corporation resurrected the Danelectro name in the late Nineties. Eric Gales always gives us something to smile about when he picks up his guitar, and this performance is no different. This time, Mr. Gales sports a John Page Classic, a favorite among many of us here at The Zoo. Watch the video above for a super-groovy jam entitled “Swamp”, written by Eric for his upcoming EP release!